I’m normally not fond of discounts, but Brilliant Distinctions fills in this gap for me and offers discounts to patients who usually like discounts. I’m fond of consistency – which is what I want in my results – excellent consistent results, and thus I like the rest of my practice, which includes pricing, to remain consistent. 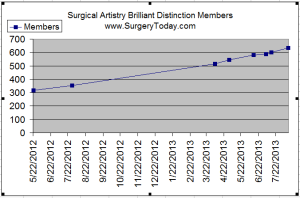 As of 8/13/13, $51,720 was paid to Surgical Artistry patients since we started participating in the Brilliant Distinctions program. Details of our Modesto Brilliant Distinctions statistics. As of 8/13/13 we have 633 BD members. This represents a special occasion because it is the doubling of the original number when I first started paying attention to our BD statistics on 5/20/12. We have been growing at a wonderful rate. I need to also thank our wonderful patients for supporting us – thank you!! I’m cc’ing Alyssa and Chris from Allergan because they are part of our team. Congratulations! 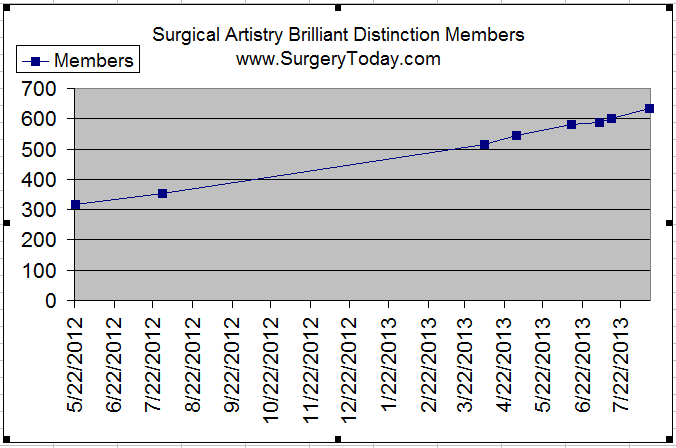 We grew the our Surgical Artistry / Brilliant Distinctions membership by one of the highest rates in our history. Although it isn’t that much higher than our average growth, it is still one of the highest rates we’ve ever had. This month we grew our patient base at a rate of 1.1 patients per day (based on ~30 days per month). Last month we grew our patient base at a rate of 1.4 patients per day. The months before that ranged from 0.53 to 1.28 patients per day. 1.1 patients per day is wonderful. If I look back in time, we have been steadily averaging 0.6-0.7 patients per day and the last two months, we beat our own averages. I think this is great. Attached is an Excel spreadsheet graph (you know how I like these), which shows that today, we doubled our membership from May 22, 2012 – the day I tracking our usage of Brilliant Distinctions. Thank you all for a record 2 months. I’m looking forward to continued excellence for our Botox & Juvederm patients. Our Modesto Brilliant Distinctions statistics. Visit us in Modesto: (209) 551-1888.